Since the end of November 2017, I own an Atik Infinity camera for taking photos of deep sky objects. On this page, I collect information about my observations, which might be of interest to other beginners. The photos that were taken during the observations are shown elsewhere on this site, for example on page Atik Infinity Colour Camera - Gallery. I selected the observation objects primarily on the basis of my literature and experiences (see references). I constrained myself mostly to the sky area in the south and southwest (according to the respective date). I chose those objects, which were "prominent" on the respective date and suitable for a photo (nebulae, open and globular star clusters). The observations started at the end of November 2017. They typically took place shortly after dusk, when it was sufficiently dark for a successful star alignment for the GoTo mount. Since mid-February, I used the Celestron StarSense module for an automatic alignment. Of course, the Atik Infinity camera is needed for taking photos. To operate the camera, a laptop on which the control program runs is also required. Depending on the telescope tube used, focal length extenders (Barlow lens, focal extender) or reducers must also be used. This is indicated for the respective observations. In addition, the telescope tube has always to be mounted on my Star Discovery GoTo mount because of the needed tracking of sky objects. At least with the Explorer 150PDS, I will use the StarSense module for an automatic alignment of the GoTo mount in the future. On February 12, 2018 I already used it more or less successfully and later on as well. And last but not least, you need a 12 V power supply for the camera and GoTo mount (and possibly one for the laptop). By the way, the StarSense module is powered by the mount. This small telescope tube (400 mm, f/4) is designed for visual observation only. With the camera, you can only get into focus when using focal length extenders (Barlow lens, focal extender). Unfortunately, this reduces the light intensity accordingly (by the extension factor). Furthermore, I did not find that the image quality was sufficient (Feb 7, 2018). I therefore will not use this combination in the future. The Explorer 150PDStube (750 mm, f/5) indicates already with a "P" in its name that it is designed for astro photography ("DS" = Dual Speed is also helpful when taking astro photos). This means that you can get into focus with the camera. With an aperture ratio of f/5 it is also sufficiently sensitive, and the focal length appears ideal (the Atik Infinity is recommended for focal lengths between 500 mm and 1000 mm). With their long focal lengths, the Maksutov-Cassegrain OTAs Skymax-102 (1300 mm, f/12.7) and Skymax-127 (1500 mm, f/11.8) are less suitable for use with the Atik Infinity camera, and they also require significantly longer exposure times due to their low aperture ratio. This can be compensated for with focal length reducers (analogous to focal length extensions). However, my combination of a 2 x focal length reducer and an extension tube achieves only a factor of 2.3 instead of one of 3 (this results in f/5.1 for the Skymax-127)... The reducer also seems to lead to vignetting. I still have to try out which factor the 2 x focal length reducer alone actually achieves and whether this leads to vignetting or not. In general, the sky above Mühlhausen/Kraichgau is "light-polluted" and does not invite you to search for deep sky objects. This is certainly one of the reasons why I found some of the deep sky objects that I wanted to observe only sometimes or not at all. For astro photography, however, light pollution is not as disturbing as for visual observations. because of M 31's size, I was only able to photograph a part of it; I saw M 32 for the first time. When searching for deep sky objects, a good preparation is obligatory - you read this, and I can confirm it. "Good preparation" means, on the one hand, that you compile a list of objects that you want to observe, including notes on where and how to find them. 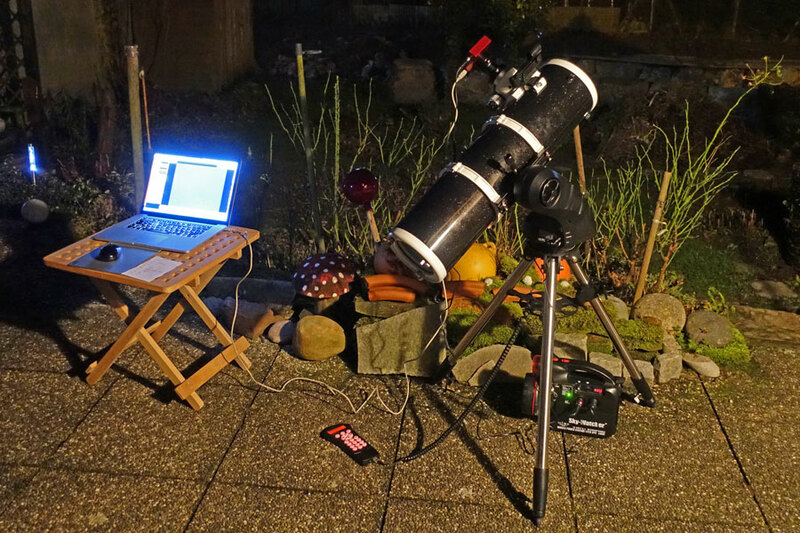 On the other hand, even when doing "quick astro photography" with the Atik Infinity camera (a variety of "video astronomy") more technology has to be prepared than for purely visual observation, especially if you just put a small Dobson or Maksutov telescope on the terrace table for this... Above, I describe, what equipment I use and need for taking photos with the Atik Infinity camera.